SLIM, STYLISH AND POWERFUL – THE 1700 SERIES HAS IT WHERE IT COUNTS. Starting off, the TV was very well packaged and once out of the box and plugged in was easy to set up. Connected to the wi-fi without any hitches. On screen menus are good and changing settings equally so. Like everything new it takes a little while to accustom yourself to all the options and where the buttons are on the remote. Bought this set as a tv for my wife's workroom but wish now I had bought it for myself !! Loads of great features included at a very reasonable price. Instruction book is somewhat confusing in places but overall the TV itself ticks all my boxes !! Very impressed with the Linsar tv. The quality is good, very easy to use and picture quality very good. Very good value for the price. Has fitted really well into my bedroom environment. Easy to set up and use. Excellent. Saw in store and liked straight away. Replaces previous tv which just stopped working. 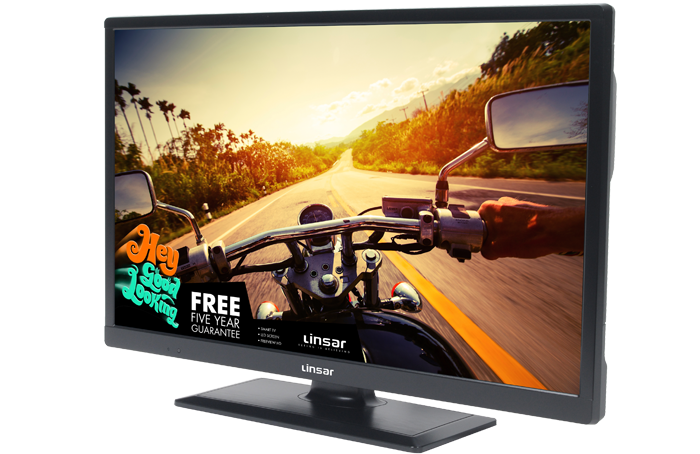 This is the second Linsar TV I have purchased. Excellent value, really good picture quality and easy to set up. This was the smallest TV we could find to put in our kitchen. The picture quality and sound are good and it fits neatly into a corner of the kitchen. I’ve not fully tested all of its capabilities as we rely on freesat for our signal as reception using freeview is poor where we live. As we have no freeview aerial we are not able to use the catch up facility but for kitchen viewing this is not a problem. The instructions that came with it could have been better and were in very small print. 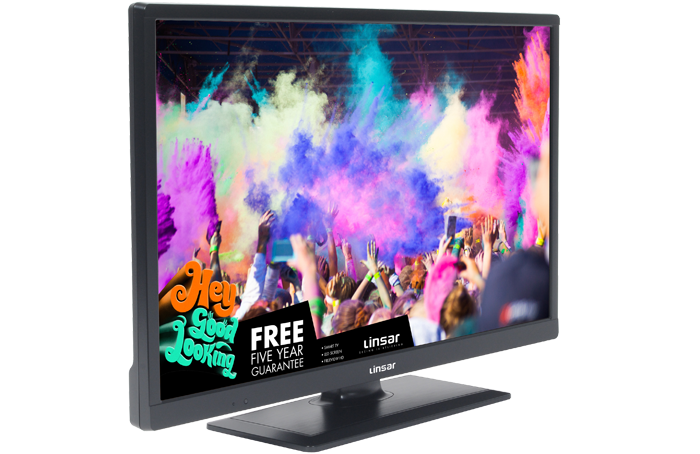 I thought the TV was good value for money and would not hesitate to recommend it. This Linsar is a good TV. I was concerned about the sound level in the John Lewis store but in our kitchen the sound is fine. Good picture, easy set up, including WiFI. The instructions are not very good. I bought this television for the kitchen after my Panasonic 24” just stopped working after 2years of very little use. John Lewis offered a 5 year warranty which took my notice. This television is working perfectly with the added bonus of being a smart tv for programmes that I may have missed. Very pleased. I'm disappointed with the picture quality, as the colour at a very slight angle from straight on is faded with not much colour definition. For the money this is a great TV for smaller rooms. OK the viewing angle is a bit limited to get the best colours but in the right location it's fine. Sound is also acceptable for a set at this price. I originally bought the Toshiba 24" and swapped for this one as the Toshiba has an auto update that is indicated by a flashing light - waking us up. This TV is essentially the same as the Toshiba - the case appears to be identical and the instruction manual and software are very similar as well (just no flashing light). The only downside is that the Description and Spec say there are 2 USB ports, but there is only one. Initially purchased another more heavily advertised make but it only received 16 TV channels and the technical support was abysmal, basically suggesting it was a poor reception area. 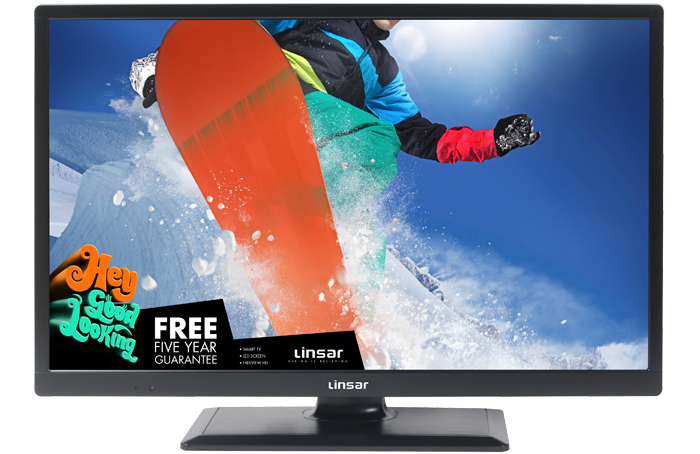 Returned it and purchased the Linsar and it is excellent value and immediately received 71 TV channels and very easy to use. Easy to set up. Good quality picture and sound. Good value as an extra TV for a bedroom. SEARCHING FOR A TV THAT HAS IT ALL? THE LED 4000 SERIES IS THE PERFECT ALL-IN-ONE SOLUTION. 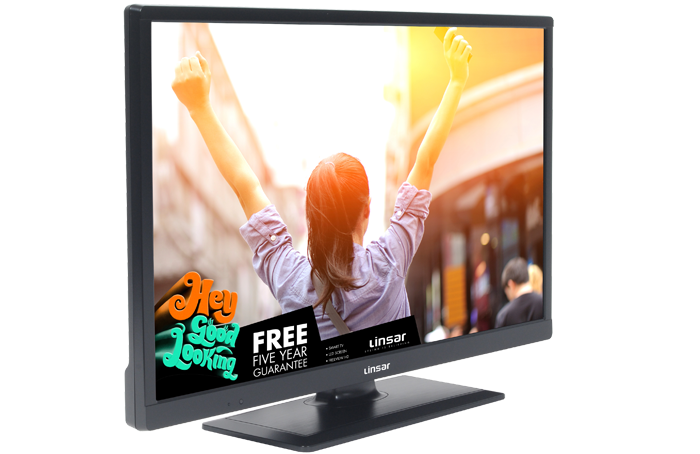 LED Smart TV/DVD with Freeview HD and Freeview Play.